I adore Anastasia! She's clever, likable, fun to read about, and easy to root for. She's holding it together quite well, considering everything her author has put her through, over seven books and three novellas. (See the Guest Post for details.) She and Zack make a cute couple. It's nice to see a lot of Nick and Alex, and to meet Alex's girlfriend Sophie and her dad Shane. I like how Anastasia keeps wanting to believe in Shane's innocence. Following the book's Epilogue is "Anastasia's No-Crafting-Talent-Required Glass Ball Christmas Ornaments," with instructions for five ornaments. These are the same ornaments that Anastasia taught Alex's senior class to make, for their fundraiser. • "But that's not the case," said Shane. "Apparently Tammy racked up quite a rap sheet over the years, mostly petty crimes like shoplifting, but she was also convicted of embezzlement and spent three years in federal prison." "To prison with her!" squawked Ralph, flying into the kitchen and coming to roost on his favorite spot atop of the refrigerator. "Measure for Measure, Act Five, Scene One." The color drained from Shane's face as he stared wide-eyed and mouth agape at Ralph. "That bird... he—"
• Zack joined me a few minutes later. Ralph sat perched on his shoulder. "You can't ever leave me," I said eyeing the bird nuzzling his beak against Zack's jaw. "You'd break Ralph's heart." "That's the only reason I stay." "Nice to know where I stand in the pecking order." • Zack ... placed him in his cage. Ralph protested with a flap of his wings and an angry squawk. "Sorry, Ralph. The restaurant doesn't allow parrots. We'll bring you a doggie bag. I promise." I raised an eyebrow. "A doggie bag?" Zack bowed to the bird. "Pardon me, Ralph. I stand corrected. A parrot bag." Ralph answered with a second squawk before adding, "Then here's a man stands, that has brought his pardon. All's Well That Ends Well, Act Two, Scene One." "I hope that means he's accepted my apology," said Zack. I eyed Ralph. He offered me a blank stare in return. "I'd say it depends on the contents of the parrot bag." As I said above, Anastasia wants to believe Shane is innocent, despite the information uncovered by the police. She discovers several other persons who may have had motives for the murder. She also discovers a possible second mystery that she and Zack investigate. The two mysteries make the plot fast-moving and can't-put-down-able. The climax is riveting, when Anastasia saves the day as "Wonder Woman." Author Lois Winston kept me guessing as to whodunit. The ending is sensational — I can't wait until Book 8 to find out what happens next! I will definitely continue with the Anastasia Pollack Crafting Mysteries. 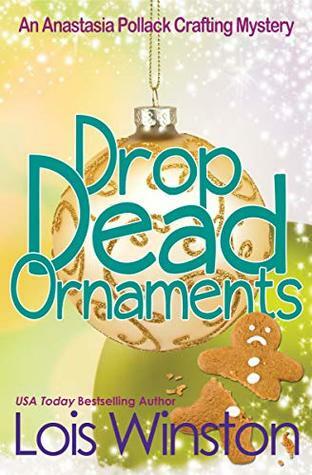 I love Drop Dead Ornaments, and recommend it to all fans of cozy mysteries. I think it will have special appeal to fans of the Empty Nest Mystery Series, previous books in the Anastasia Pollack Crafting Mystery Series, and other books by Lois Winston / Emma Carlyle. I hereby bestow upon Drop Dead Ornaments my highest rating of Five Kitties! Note: I voluntarily reviewed a complimentary copy of Drop Dead Ornaments. Many readers also like to choose their books based on the seasons and holidays. Few people read “beach books” by the fire during a winter blizzard or Christmas-themed books while bikini-clad on a blanket by a sandy shoreline. If you’re one of those readers who looks forward to Christmas-themed books, you’ll be happy to know that the newest book in my Anastasia Pollack Crafting Mystery Series takes place at Christmastime. Fast-forward one year and seven books later, and Anastasia is slowly working her way out of debt. She’s also found love again, but she’s still stuck with her mother-in-law, and the dead bodies haven’t stopped piling up. What can I do, though? I’m writing an amateur sleuth mystery series. I’ve got to have some mysteries for her to solve, don’t I? And although it’s the time of year for peace on earth and goodwill toward men (and women), not all is peaceful and full of goodwill in Anastasia’s world. There’s a killer on the loose, and as far as Anastasia is concerned, the police are looking at the wrong man as their prime suspect. 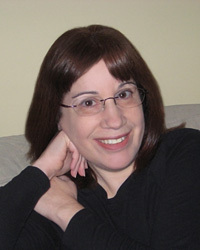 In addition, Lois is an award-winning craft and needlework designer who often draws much of her source material for both her characters and plots from her experiences in the crafts industry.